Is Cuomo Ditching Kids in His Medicaid Reform Plan? What’s Needed for ‘3-K for All’ and Child Care Centers to Work and Play Well Together? Earlier this month, the New York City Department of Education (DOE) released a long-awaited plan designed to increase diversity in the city’s public schools. (The plan refrained from using the terms “integrated” and “segregated” schools, a decision City officials defended saying that “diversity” is a broader term.) Noteworthy in the plan are two numeric goals the DOE proposes to use as “yardsticks” to measure their progress. Outside observers have celebrated these goals as a “bona-fide breakthrough” and also criticized them for “aim[ing] too low.” But the plan itself lacks sufficient detail and context to make such evaluations. 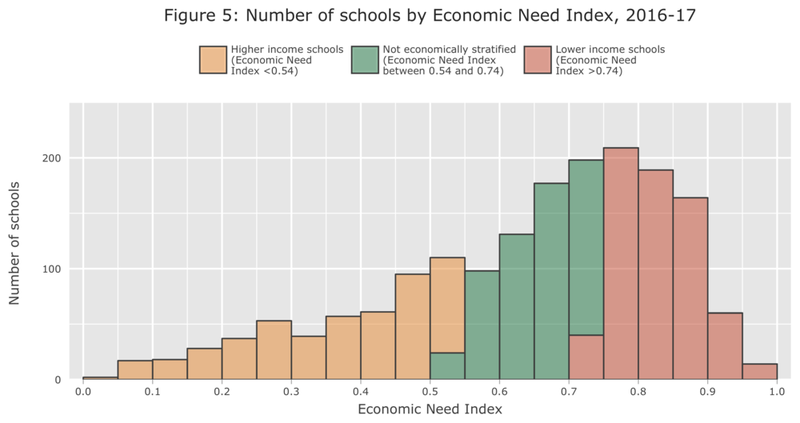 Reducing the number of “economically stratified” schools by 10%. Our over-arching finding: Although these targets may have significant impact on the lives of the individual children affected, achieving them would represent only minimal changes to the system as a whole. No heavy lifting will be needed to meet them. Indeed, if recent demographic shifts that have occurred in our schools merely continue apace for the next five years, the DOE will be able to meet these diversity goals without implementing a single one of the dozen policies they recommend in their new plan. Using publicly available data from the DOE, we examined student demographic patterns over the last five years both to make predictions about what might happen for the next five years and to critically assess the DOE’s new goals. The way such demographic shifts manifest themselves in each school depends greatly on its neighborhood, the grade levels it serves, and the rules that determine eligibility for admissions – and we looked at these factors as well. We’ve also created an interactive map showing the current status of all 1,757 public schools in New York City in terms of both goals, with filters that allow you to select schools based on grade level, admissions method and community school district. We hope this map will be a guide to the School Diversity Advisory Group that the DOE will convene to evaluate this plan over the next year. We encourage them to use it to identify and target the specific neighborhoods and types of schools that suffer the most from racial segregation and economic stratification, and craft more ambitious strategies to correct these inequities. The first goal aims to increase the number of students at “racially representative” schools by 50,000 over the next five years. The DOE defines a racially representative school as one that has between 50 and 90 percent black and Hispanic students because “black and Hispanic children make up 70 percent of our students citywide.” According to the DOE’s publicly available Demographic Snapshot of 2016-17, which is our primary data source for this policy brief, black and Hispanic students make up 67 percent of the total enrollment of students. Rounding this proportion up to 70 percent allows the DOE to set a more memorable goal—50 to 90 percent is, of course, easier to communicate than 47 to 87 percent—but it also makes it easier to reach the DOE’s goals. Below we describe how schools at these margins can seem to produce significant numerical change, but perhaps limited real change, in the racial make-up of the system. By most measures accepted in the extensive academic literature on school segregation, many of the schools within the DOE’s racially representative range would still count as intensely segregated. Currently, 502 of the city’s 1,757 schools, having slightly fewer than one-third of students citywide, already meet this “representativeness” criteria. Fully half of all schools in the city—869 schools serving over 400,000 students—have higher than 90 percent black and Hispanic students. Conversely, only 22 percent of schools sit on the other end of the racially representative range, with fewer than 50 percent black and Hispanic students. However, these 386 schools serve almost 30,000 more students than all the 502 racially representative schools combined. While the DOE’s plan is ambiguous as to whether they will consider these schools, which segregate white and Asian students, to be equally problematic as the schools that segregate black and Hispanic students, they are the other side of the same diversity coin. Citywide, the number of students at schools meeting the racially representative goal has increased by over 34,000 over the past five years, at an average growth rate of 2.4 percent per year. This has happened in the absence of any citywide diversity policy, and it is due primarily to an increase in the total number of white and Asian students across the city and a decrease in the number of black students in the system overall. If these demographic shifts were to continue at only a slightly higher growth rate of 2.9 percent, about 10,000 additional students would find themselves in racially representative schools each year over the next five years, thus meeting the DOE’s goal. It is important to point out that this does not mean that 10,000 students would have to shift schools each year. If a school changes from 91 percent black and Hispanic to 90 percent, or 50 percent white and Asian to 49 percent, its entire student body would count towards the 50,000-student goal. As Taylor McGraw points out in the most recent episode of his education policy podcast, The Bell, “If the 105 schools currently between 90.1 percent and 92 percent black and Hispanic fell to 90 percent (moving an average of just one percentage point), the city’s goal would be reached.” This could be accomplished if only 1,112 white and Asian students decided to attend these 105 schools, an average of only 10 students per school. Seen in this light, it’s hard not to conclude that the DOE’s goal is timid and sets a benchmark that it can easily achieve. In fact, the only barrier that may stand in the way of reaching this goal is the rapid concentration of students into the predominately white and Asian schools. The majority of the schools that had below 50 percent black and Hispanic students five years ago have even lower proportions of these students today. Over the same time period, the number of students at those schools has increased by more than 34,000. This more than cancels out all the progress that has been made on the other end of the goal’s range, where 30,000 fewer students now attend highly segregated black and Hispanic schools than did five years ago. A second goal is to decrease the number of economically stratified schools by 10 percent (150 schools) over the next five years. DOE defines a school as economically stratified if its Economic Need Index (ENI) is 10 points above or below the citywide average. The ENI is a measure that incorporates several factors, including students living in temporary housing, eligibility for public assistance benefits in student households, recent immigration status, and level of family poverty in each student’s home census tract. In 2016-17, the average ENI for all schools citywide was 0.64, so using DOE’s 10-point threshold we considered schools with an ENI below 0.54 as skewed towards higher incomes and schools with an ENI above 0.74 as skewed towards lower incomes. The distribution of ENI across all schools is more of a bell curve than the picture of racial distribution of students. There is, however, still a higher concentration of students at the low-income end. In 2016-17, 588 schools had already met the goal of an ENI in the 0.54-0.74 range; they represent 33 percent of all the schools and 35 percent of all students. Thirty-eight percent of all schools are skewed towards lower incomes, and 28 percent are skewed towards higher incomes. As with the first goal, progress towards the second goal is already underway: the number of schools between 0.54 and 0.74 ENI has increased by 44 over just the past two years, at an average growth rate of four percent per year. That means that the DOE could reach its “economic stratification” goal in five years even at a slightly higher growth rate of 4.6 percent per year without having to make any changes to the status quo. Because most of the data that goes into the ENI formula is not publicly available at the individual level, we are unable to determine how many students would need to shift within the system to meet this goal. However, based on trends over time and aggregate data, it appears that this goal will be quite easy to achieve. But as with racial representativeness, it is possible that the rapid concentration of advantaged students into higher-income schools can prevent that from happening. Although low-income schools have decreased by 114 over the past two years, high-income schools have increased by 106. Moreover, the growth rate of high-income schools has been three times faster than the growth rate of schools in the ENI goal range. The patterns of racial and economic segregation we have described thus far are not spread evenly across the city as a whole. For example, all 27,000 students in the South Bronx’s District 7 are at schools with at least 90 percent black and Hispanic students and 95 percent skew towards lower incomes. Districts 9 in the Bronx and 18, 23, and 32 in Central Brooklyn follow close behind District 7 with the lowest shares of racially representative schools: only eight schools with just 2,500 students across those five districts qualify. But not all of these districts are as economically segregated as they are racially segregated: District 18 has only one school that would count as skewed towards low income, and has the second-highest share of schools—65 percent—that already meet the DOE’s economic goal. On the other extreme, District 20 in South Brooklyn and Districts 25 and 26 in Queens do not have a single school with such high proportions of black and Hispanic students; over 100,000 students in those districts attend schools that are majority white and Asian. District 26 is also severely economically stratified, with all 32,000 of its students attending schools that are skewed towards high incomes. Fortunately, there are bright spots where the possibility of racial and economic integration is near. Districts 24, 27, and 30 in Queens and District 1 on Manhattan’s Lower East Side have the highest proportions of schools that currently qualify as racially representative: over half of all the schools in those four districts have between 50 and 90 percent black and Hispanic students. Districts 17, 18, and 21 in Brooklyn and 11 in the Bronx have the highest share of schools that already meet the economic goal, at above 60 percent of all their schools. There are differences across school types as well. High schools, most of which accept students from anywhere in the city, are more likely to already meet the racial and economic goals than schools serving other grade levels. Nearly half of all high schools are considered not economically stratified, but this is true for only 26 percent of elementary schools. But the relatively small proportion of high schools that are skewed towards higher incomes—18 percent—tend to have larger student bodies, so they serve 32 percent of all high school students in the city. The schools that span grades K-8, 6-12, or K-12 are the most segregated, with 80 percent of such schools falling outside the racially representative range. Many of those schools are charter schools, which in New York City tend to have more black and low-income students than other schools nearby. This indicates that admissions method, more than grade level, plays a large role in how students are distributed by race and economic need. For example, only 16 percent of charter schools at all grade levels fall within the racially representative range, and almost all the other charter schools have greater than 90 percent black and Hispanic students. In fact, while charter schools represent only 10 percent of students citywide, they comprise 21 percent of all the students in the city who attend schools with greater than 90 percent black and Hispanic students. Charter schools use random lotteries to select from their pools of applicants, but many other schools in the city select applicants based on their scores on tests, auditions, or prior academic records. At the elementary school level, these are the schools with “Gifted and Talented” programs, and they tend to be highly segregated: only 22 percent of them are within the racially representative range and 62 percent of them have majority white and Asian students. By contrast, almost a third of elementary schools with dual language programs, which the DOE identifies as a way to increase racial diversity, are within the racially representative range. Selective middle and high school admissions methods also have a strong influence on racial and economic segregation in school populations. All eight high schools that require top scores on the Specialized High Schools Admissions Test fall far below the threshold for the racial representative goal, with an average of 14 percent black and Hispanic student enrollment. They are also all are skewed towards higher incomes. Some admissions policies work better at achieving economic balance than racial balance. That includes middle schools that use academic screens, such as 4th grade standardized test scores. They tend to have majority white and Asian populations, but are more economically than racially balanced. Set the range for “racially representative” around the actual citywide share of black and Hispanic students—67 percent in the 2016-17 school year—so that there’s less likelihood that very small changes in racial composition of enrollment will count toward meeting the DOE’s diversity goals. Establish more ambitious goals in reducing the number of economically stratified schools. Given that individual schools and districts have tools in hand to make this happen (they are permitted to prioritize students for admissions based on their socioeconomic characteristics), this is practicable and would likely lead to more racially integrated schools as well. Set targets in each community school district rather than citywide. This will inspire local strategies specific to the demographic characteristics of each neighborhood, and will ensure that progress made in some neighborhoods will not mask deepening segregation in others. Publish each school’s status in relation to these goals and its progress over time in the School Quality Snapshots and Directories. This information will aid parents who want to choose diverse schools for their children and will encourage school leaders to do their part in working towards these goals. Finally, call it what it is: We should acknowledge that these goals are necessary because our public schools are among the most segregated in the nation. Only with such honesty and clarity can we have the necessary conversations and take the required steps to do this work with the urgency it deserves. This report was made possible with generous support from the New York Community Trust, Deutsche Bank Americas Foundation, and the Robert Sterling Clark Foundation. Nicole Mader is a senior research fellow at the Center for New York City Affairs and a doctoral candidate in public and urban policy at the Milano School of Management, International Affairs, and Urban Policy at The New School. Ana Carla Sant’Anna Costa is a quantitative research assistant at the Center for New York City Affairs and a master’s candidate in nonprofit management at the Milano School of Management, International Affairs, and Urban Policy at The New School. Katherine Safter helped with data analysis and visualization for this report. she is an education and political science major at Haverford college and a summer intern for the center for new york city affairs. The DOE also set a third citywide goal, which concerns how “inclusively” English Language Learners and students with disabilities are served at each school. We are not analyzing that goal here because there is no publicly available data to determine the availability and quality of such services. For the purposes of measuring racial representativeness, we calculate citywide student enrollment to include charter school enrollment, but we didn’t include special education schools, schools for students involved in the criminal justice system, or community-based Pre-K programs. It appears that the DOE used the same calculations, because when charter schools are excluded the proportion of black and Hispanic students drops to 64% of students citywide. It is unlikely they would have rounded this figure up to 70% in their description of the racial representativeness goal. This assumes the number of black and Hispanic students at each of these schools stays the same. Unlike the race and ethnicity categories that have been used consistently and collected from all schools, including charter schools, since the 2010-11 schools year, the formula for ENI has shifted several times over the past few years. The DOE’s most recent Demographic Snapshot provided ENI calculations that used this new formula only for 2014-15 through 2016-17.